Christmas Fairy Lights 6-Piece Set Just $10.99! Down From $30! You are here: Home / Great Deals / Amazon Deals / Christmas Fairy Lights 6-Piece Set Just $10.99! Down From $30! Make your Christmas brighter with this Christmas Fairy Lights 6-Piece Set which is on sale at Amazon for just $10.99 down from $29.99 PLUS FREE shipping with Amazon Prime or for orders over $25! With bendable thin wires and 20 micro LEDs, these fairy lights are perfect for crafting; with 6 sets,you can make you shiny fairy dress and cool costume, illuminate your daughter’s lovely dollhouse and create unique floral applications! You can also decorate your dinner table centerpiece, wedding party reception table, adding some romantic touch to your events. A Terrific Designing Tool – you get a set of 6pcs YIHONG fairy string lights with cool white color, each light is with 6.2feet (1.9M) flexible thin silver wire and 20pcs glowing micro leds;with those versatile lights,you can DIY your own fairy dress, halloween costume;decorate your party reception table centerpiece or DIY some mason jar lights for camping, BBQ,picnic;or just keep it at hand in case of power outage. Mini Size, Battery Compartment easy to hide – The size of battery pack of the fairy string light is only 0.9*2 inches, which makes the fairy light very easy to hide, perfect for decorating your halloween trees, christmas trees, or clear dome umbrella, make cool jellyfish costume for your kids, or any other unique lighting projects you desire. 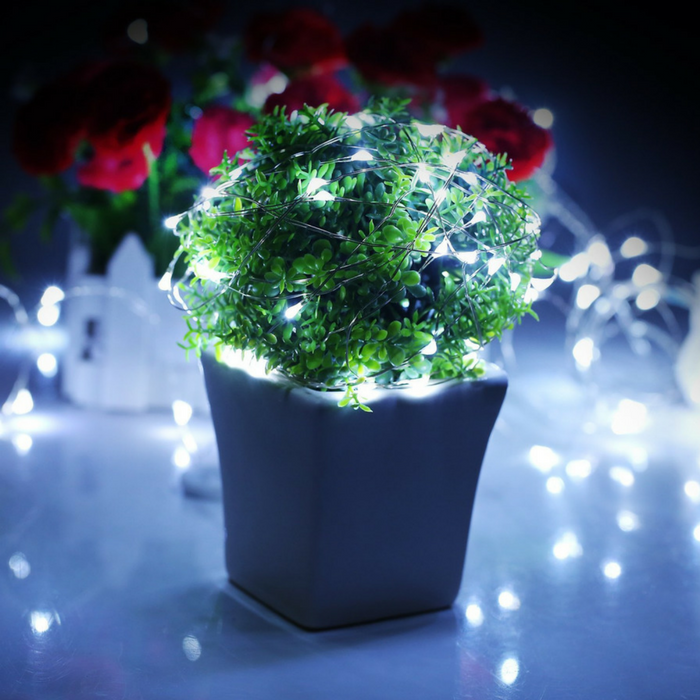 Each String Light is powered by 2*Lithium Cells (included); battery compartment is with ON/OFF switch; no worries of where to find a outlet, simply switch on the fairy lights and make amazing costume decor or cosplay for Halloween, Christmas, wedding, New Year’s Eve and more.